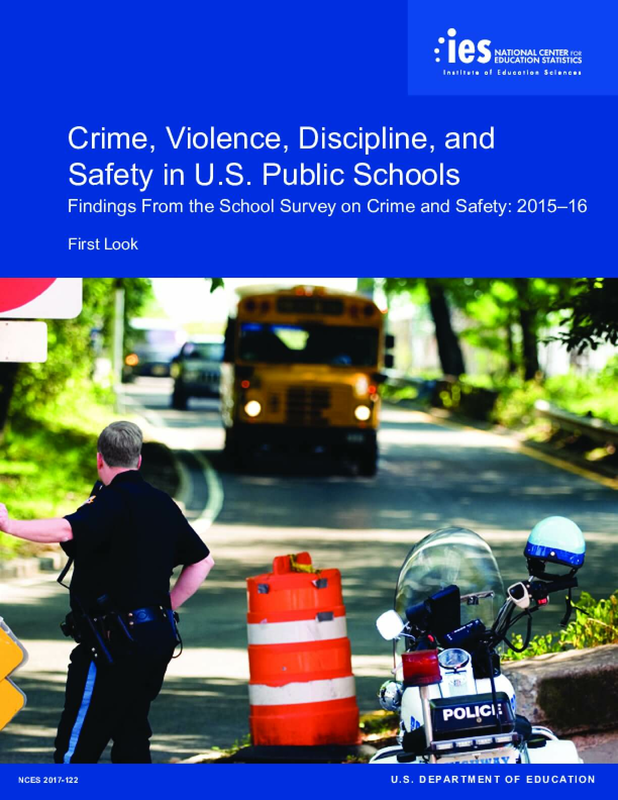 These reports present key findings on crime and violence in U.S. public schools, using data from the School Survey on Crime and Safety (SSOCS). 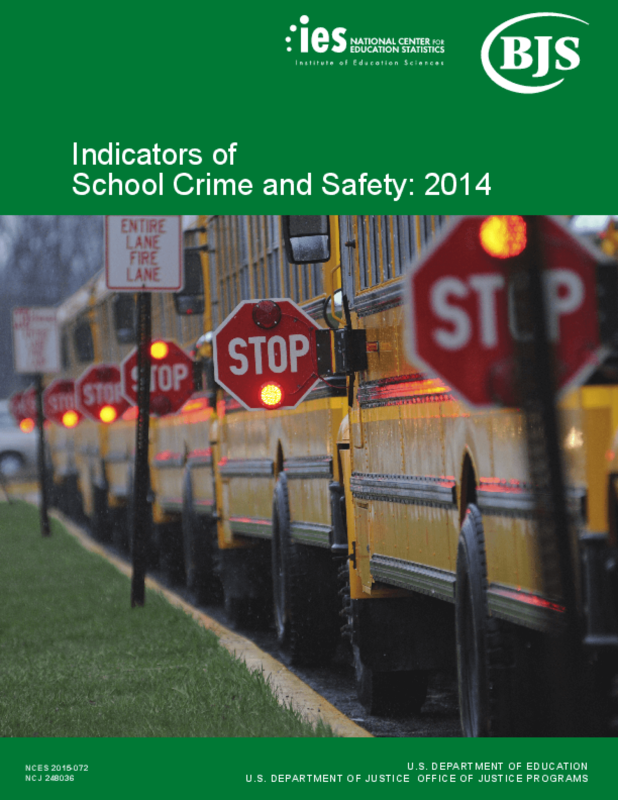 SSOCS provides information about school crime-related topics from the school's perspective, asking public school principals to report the frequency of violent incidents, such as physical attacks, robberies, and thefts in their schools. Portions of this survey also focus on programs, disciplinary actions, and policies implemented to prevent and reduce crime and violence in schools. The survey was first administered in the spring of the 1999–2000 school year and repeated in school years 2003–04, 2005–06, 2007–08, 2009–10, and 2015–16. The 2015–16 survey was developed by the National Center for Education Statistics of the U.S. Department of Education with the support of the National Institute of Justice of the U.S. Department of Justice. 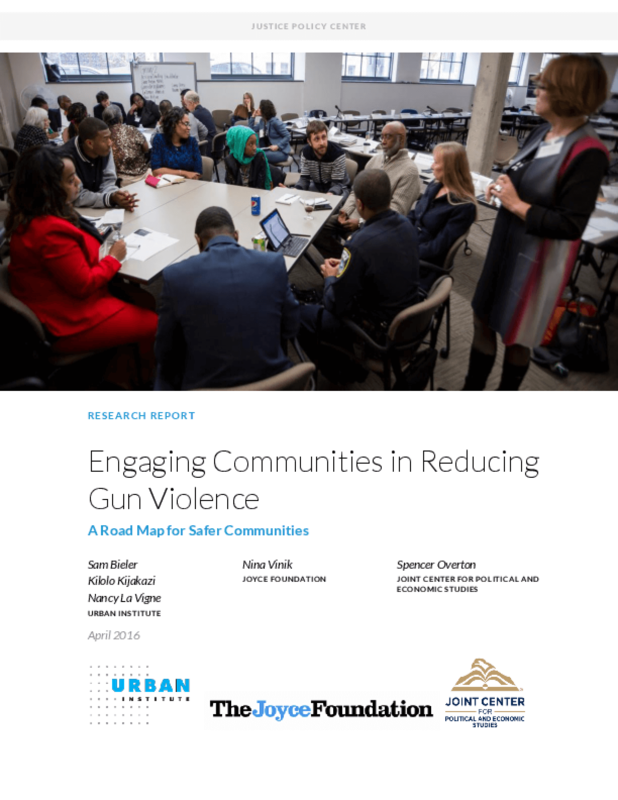 Groundbreaking research by Benenson Strategy Group (BSG) and Lester and Associates was released on April 28, 2016 alongside a policy roadmap that lays out a series of proposed policy solutions for gun violence based on conversations with community stakeholders in Richmond, VA, Milwaukee, WI, and Stockton, CA. The research and report grew out of a project launched last year by The Joint Center for Economic and Political Studies, The Urban Institute and The Joyce Foundation. The study found that African Americans and Latinos believe that fixing the gun violence crisis in the United States is a pathway to addressing issues with the criminal justice system, including police-community relationships and mass incarceration. 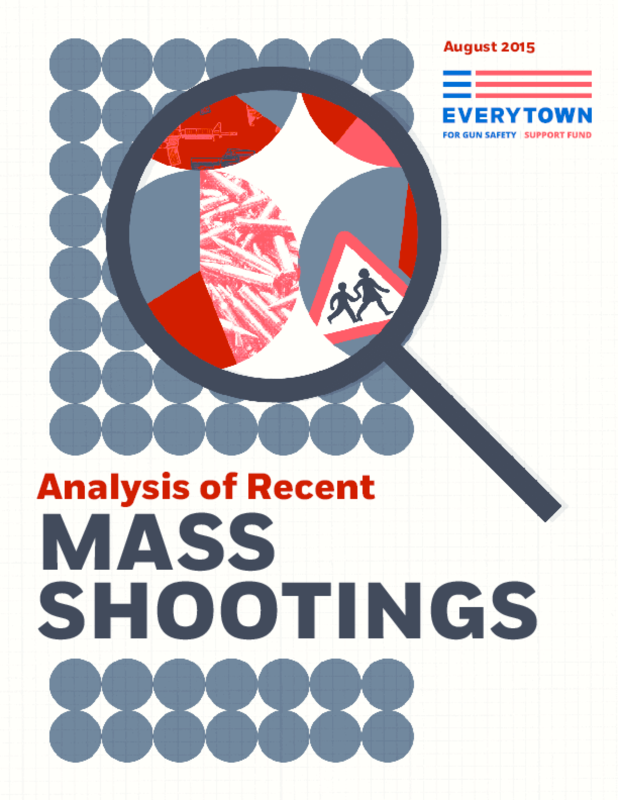 Everytown For Gun Safety conducted a comprehensive analysis of every mass shooting between January 2009 and July 2015 that was identifiable through FBI data and media reports. This report describes the 133 mass shootings -- almost two per month that occurred in 39 states in the nearly seven-year period. Each description includes the location of the shooting, number of people killed and/or injured, and information on the shooter, gun(s), ammunition, and gun purchase, where available. The FBI defines "mass shooting" as any incident where at least four people were murdered with a gun. Everytown For Gun Safety reviewed mass shootings in the FBI's Supplementary Homicide Reports from 2009-2012 and searched the media for further details about these incidents as well as for mass shootings that occurred in 2013 -- 2015. This survey includes every shooting we identified in which at least four people were murdered with a gun. And the findings reveal a different portrait of mass shootings in America than conventional wisdom might suggest. Two years after the failure of Senate legislation to expand background checks on gun purchases, the public continues to overwhelmingly support making private gun sales and sales at gun shows subject to background checks. 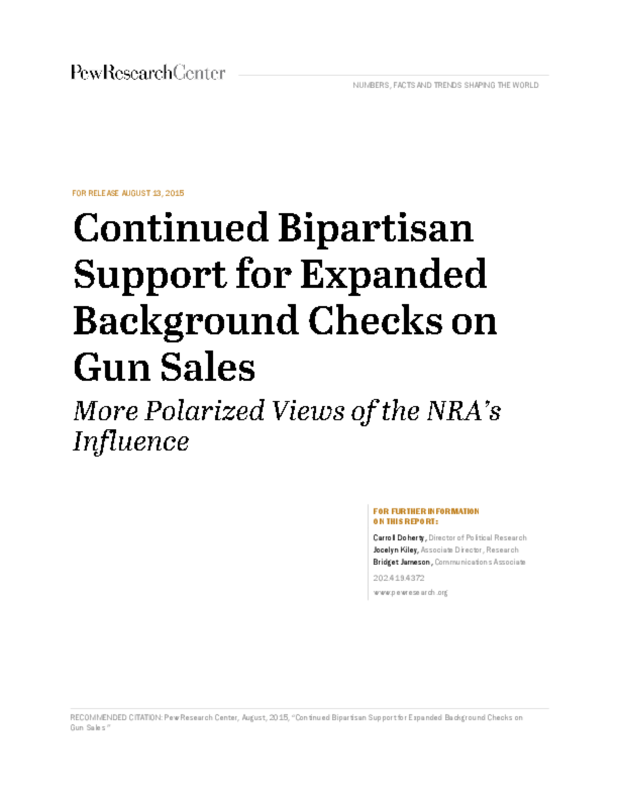 Currently, 85% of Americans -- including large majorities of Democrats (88%) and Republicans (79%) -- favor expanded background checks, little changed from May 2013 (81%). The analysis in this report is based on telephone interviews conducted July 14-20, 2015 among a national sample of 2,002 adults, 18 years of age or older, living in all 50 U.S. states and the District of Columbia (700 respondents were interviewed on a landline telephone, and 1,302 were interviewed on a cell phone, including 758 who had no landline telephone). The survey was conducted by interviewers at Princeton Data Source under the direction of Princeton Survey Research Associates International. A combination of landline and cell phone random digit dial samples were used; both samples were provided by Survey Sampling International. Interviews were conducted in English and Spanish. Respondents in the landline sample were selected by randomly asking for the youngest adult male or female who is now at home. Interviews in the cell sample were conducted with the person who answered the phone, if that person was an adult 18 years of age or older. As previous Pew Research Center surveys have found, there is broad support for expanded background checks even from those who say it is more important to protect gun rights than to control gun ownership. Gun violence exacts a lethal toll on public health. 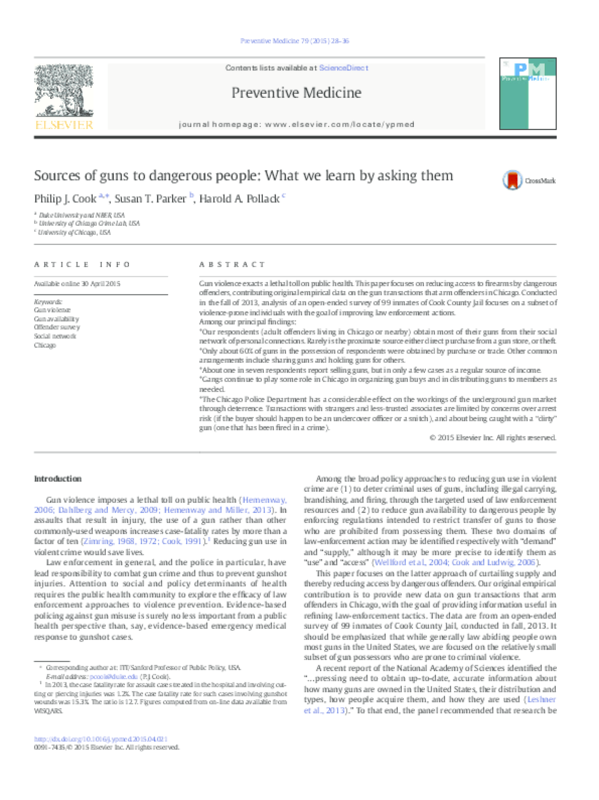 This paper focuses on reducing access to firearms by dangerous offenders, contributing original empirical data on the gun transactions that arm offenders in Chicago. Conducted in the fall of 2013, analysis of an open-ended survey of 99 inmates of Cook County Jail focuses on a subset of violence-prone individuals with the goal of improving law enforcement actions. Among our principal findings: Our respondents (adult offenders living in Chicago or nearby) obtain most of their guns from their social network of personal connections. Rarely is the proximate source either direct purchase from a gun store, or theft.Only about 60% of guns in the possession of respondents were obtained by purchase or trade. Other common arrangements include sharing guns and holding guns for others.About one in seven respondents report selling guns, but in only a few cases as a regular source of income.Gangs continue to play some role in Chicago in organizing gun buys and in distributing guns to members as needed.The Chicago Police Department has a considerable effect on the workings of the underground gun market through deterrence. Transactions with strangers and less-trusted associates are limited by concerns over arrest risk (if the buyer should happen to be an undercover officer or a snitch), and about being caught with a "dirty" gun (one that has been fired in a crime). 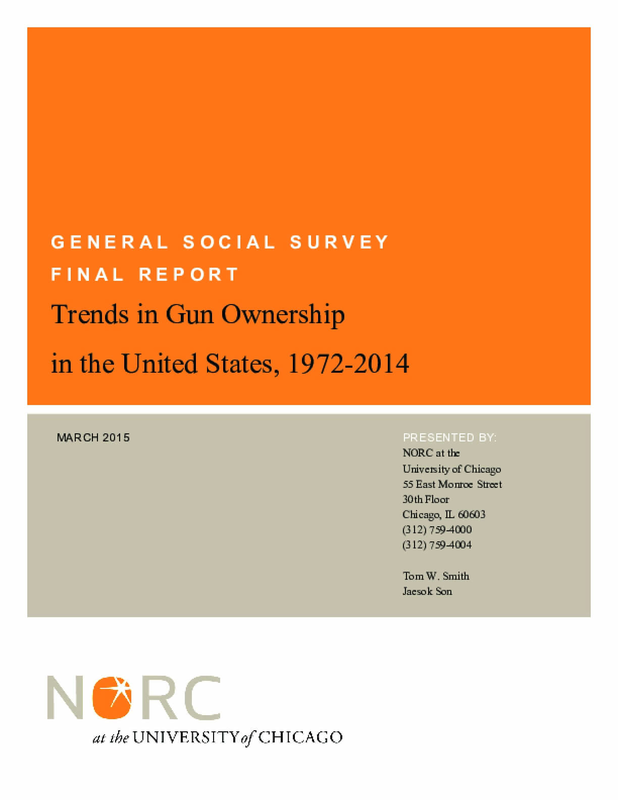 Survey showing household ownership of firearms in recent decades is slowly declining. Guns in the hands of the dangerously mentally ill have taken the lives of too many people. Mass shootings, like the shooting in a parking lot in Tucson, Arizona in January 2011, and the shooting in a movie theater in Aurora, Colorado in July 2012, have brought this problem to the attention of the American public. Experts have objected to the media's emphasis on mentally ill mass shooters, because mental illness is not the cause of most forms of gun violence toward others. Nevertheless, mental illness certainly plays a role in this violence, as the recent surge in mass shootings demonstrates. In fact, mental illness plays an even greater role in gun suicides, many of which could be averted if guns were temporarily removed from the situation. Existing state laws do not do enough to remove access to guns from dangerously mentally ill people. 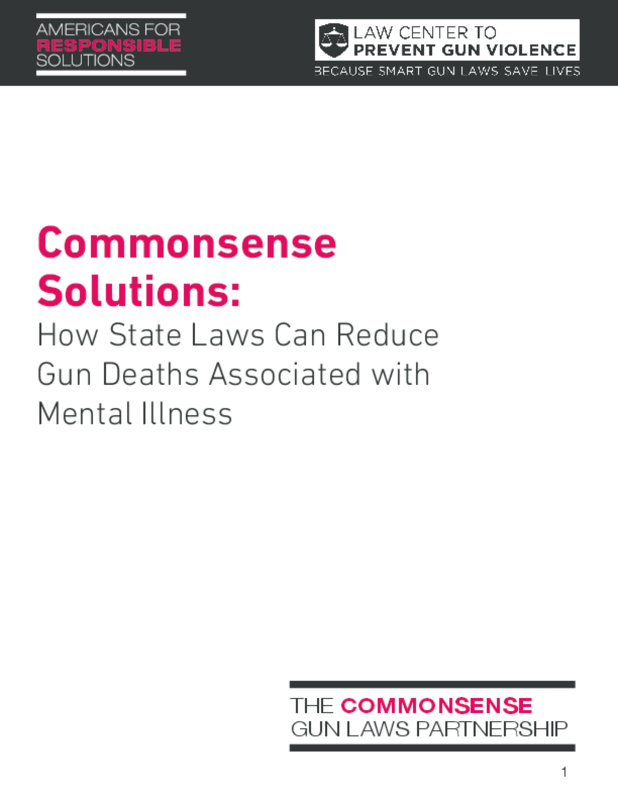 This report provides a series of proposals that state legislators should consider to address this problem and save lives.